As it drifts out of our low-attention-span popular consciousness, I can finally say: I had a heck of a time processing the Charlie Hebdo massacre. I really did. It was monstrous, horrific, and an absolutely unjustifiable act. Violence cannot be allowed to silence speech, the protection of which is a vital part of both individual and religious liberty. But having seen the cartoons, and read some of the translated pieces of that magazine, I can honestly say that I didn't find them funny or insightful. Just sort of crude, by every definition of that word. It didn't have the bite or elegance of, say, The Onion, which is so often cultural satire at its very best. Or the Daily Show. Or Colbert's recently lamented report. Most of the time, Charlie Hebdo seems to lack...subtlety. Americans? More subtle than the French? Quoi?! C'est absurde! Mais...c'est vrai. That, and something else, something harder. Charlie Hebdo is often more than a little mean, focused on attacking a struggling immigrant minority, mocking and lambasting them for their poverty and ignorance. French Muslims have no power, and minimal representation, and control no significant part of the French economy. There's just no reason to attack those who are weaker than yourself, unless you're trying to score points by stoking popular ressentiment. I could not say, #jesuischarlie, back when we were all supposed to be saying that, because I wasn't, any more than #jesuisanncoulter. I just would never express myself in that way. With the murdered being buried, that seemed awkward to bring up. But how to come to terms with someone who uses their freedom in a way you would not? On the one hand, you want to defend their liberty. On the other, you cringe when they do. How can I frame this? 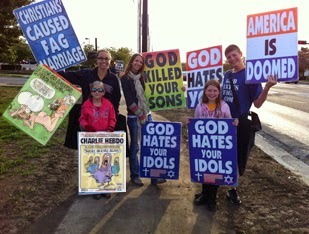 Here, once again, the good folks at Westboro Baptist Church came to my rescue. Westboro, as I have argued before, is America's most successful deep-cover troupe of Queer Christian Performance Artists. Their deeply biting satirical portrayal of a venomous theo-cultural bias has done more to advance the cause of gays and lesbians in America than any other organization. By holding a mirror up to what some Christians purport to believe, they show the moral untenability of that position. They have helped move America towards a more welcoming stance. More importantly, they show the boundaries of free speech. What Westboro is saying is utterly reprehensible, bullying towards a minority and the vulnerable, and crudely cast, and yet they absolutely have the right to say it. It would be an unacceptable affront to human liberty if they were legally coerced into stopping their bizarre demonstrations. It would be tragic...yes, tragic...if they were physically harmed. And there, I was given a conceptual handle to help me come to terms with secular Charlie Hebdo, which, though often willfully offensive, comes nowhere near the wildly horrible displays of the religious Westboro troupe. If I can defend the rights of Westboro Baptist, it is far easier to see where Charlie fits into the scheme of human discourse.